We (the Andersons) drove to Williamsburg early Sunday and came back Monday afternoon. It was a short trip, but we all had a wonderful time (more about that later). Even the car ride was smooth. 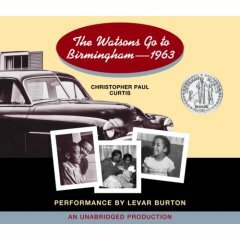 Milly slept a lot of the way there; the rest of us listened to the first half of The Watsons Go to Birmingham--1963 by Christopher Paul Curtis; terrific performance by Levar Burton (Listening Library, 2005). I think we identified with the Weird Watsons (minus "official juvenile delinquent" big brother Byron). There's dad Daniel, who likes to "cut up;" mom Wilona, who never got used to the cold in Michigan; middle brother Kenny, the narrator; and his little sister Joetta, sleeping in the backseat. Our favorite chapters were about Kenny and how he became friends with Rufus (we love Rufus); but it's the family and especially the sibling relationships that are at the heart of The Watsons Go to Birmingham--1963. We decided not to listen to the second half of the book on the way home after it became obvious that the Watsons were driving not just to Birmingham, but to the Sixteenth Street Baptist Church on a Sunday morning, 1963 (I know, I should have suspected it from the start. I think the book is even dedicated to the four little girls, but I was listening to the audio version which doesn't include the dedication). Anyway, I didn't think Leo was ready to hear it, but I'm going to make myself read the rest of it tonight. Highly recommended.